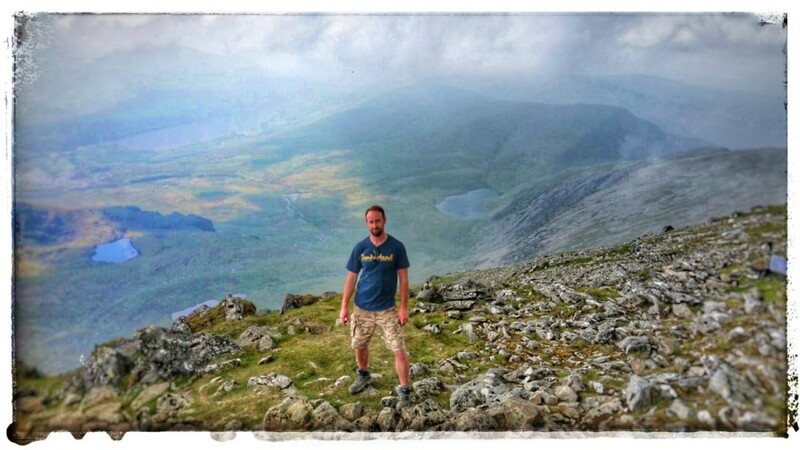 Having recently discovered I shared a liking for hiking and all things outdoors with my Dad, he pointed out that he’d always had an ambition to climb Mount Snowdon in North Wales. “No problem, I can do that,” I said figuring that if my old dad at 75 could do it then surely I could too? After vigorous training – hitting the gym treadmill and a few days of Mum’s home cooked dinners, with probably a little too much red wine (well I don’t see them that often!) – the day of the climb arrived. For the first half of the ascent I was bounding along, dragging Dad with me. I was flying. However, as the path got narrower and the drops more severe, I discovered that I have no head for heights. This is where the wheels came off for me and I spent the next couple of hours sitting on a rock with my tail between my legs whilst my 75 year old dad finished the climb by himself. “Never mind son, you’ve just inherited your mother’s head for heights, I could never drag her up here either!” he said cheerfully on the way back down. It was a nice day, but I felt kind of empty. Fast forward two years and whilst looking through the Happynesshub page and in particular a blog that Marta had written, I noticed that she mentions a climb up Mount Kilimanjaro. Something stirs in me and that night I decide it’s time to lay the ghost of Snowdon to rest! A couple of phone calls later and despite the fact that both of my potential climbing buddies have young families and busy schedules, they’re up for it, and a date is set! So back to the treadmill and to try and keep it interesting, I added a few laps around Ruislip Lido (running is not really my thing). Then having armed myself with the emergency meditation clips from the 21-Days tool kits, I felt ready to go again. The climb began and having gained a bit of a lead on my companions, I found that I had a few moments to sit on my rock from the previous attempt and go through a few last minute breathing exercises to prepare myself for the next stage. I was soon greeted by some fantastic views and even steeper drops, but whilst I could feel a slight wobble in the knees, it felt a little different somehow. At this point I was kinda using my ‘Happy Song’ list as an inspiration song, so maybe it was ‘Eye of the Tiger’ or ‘Ride of the Valkyries’ that pushed me onwards! After a while, as we approached the summit, a layer of cloud that had descended cleared and we were greeted by yet more epic views. If anyone out there is in need of any inspiration for a ‘Walk of Awe’ this must be well worth considering! I felt pretty pleased with myself as we wandered around the summit and in a way, being almost as far out of my comfort zone as I’d ever been, didn’t seem so uncomfortable at all. I realised now that, as a bonus, with having no wifi or phone signal up there, it was a perfect opportunity for a digital detox! It couldn’t last too long though as upon reaching the bottom again I had to switch the phone back on to let the folks know that I’d made it. The whole experience had sent my happy score out of 10 pretty much through the roof. Now, I’m guessing that when Sally and the guys were putting the Happynesshub together it wasn’t with the intention of sending people scurrying up mountains, but some of the hints and tips I took from it were a massive help both in the build up and on the day itself. There’s also a good chance that if I hadn’t had the nudge to give it another go, the whole adventure would be just another thing on my ‘to do list’. Now all I have to do is learn a foreign language, write a novel and learn to play a musical instrument and I’ve cracked it! Well, I’ll see about all that, but whilst I have to admit to being a little sceptical of gratitude jars at first, just at the moment, mine feels pretty full. Love this story Dan! Many more mountains to trek and many more stories to write. Keep us updated, so we can cheer you on. And who knows, you might be the one who inspires me to take up another challenge.